Here’s how an e-commerce business tested different ad copy and images on Facebook to lower their CPA by 70 percent over three months. Testing for only SEO or only CRO isn’t always ideal. Some changes result in higher conversions and reduced site traffic, for instance, while others may rank more highly but convert less well. 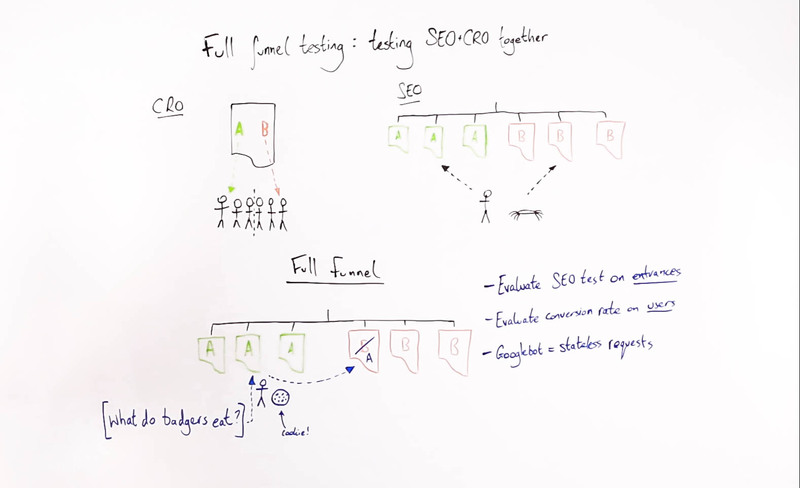 In today’s Whiteboard Friday, we welcome Will Critchlow as he demonstrates a method of testing for both your top-of-funnel SEO changes and your conversion-focused CRO changes at once. Hi, everyone. Welcome to another Whiteboard Friday. My name is Will Critchlow, one of the founders at Distilled. If you’ve been following what I’ve been writing and talking about around the web recently, today’s topic may not surprise you that much. I’m going to be talking about another kind of SEO testing. Over at Distilled, we’ve been investing pretty heavily in building out our capability to do SEO tests and in particular built our optimization delivery network, which has let us do a new kind of SEO testing that hasn’t been previously available to most of our clients. Recently we’ve been working on a new enhancement to this, which is full funnel testing, and that’s what I want to talk about today. So funnel testing is testing all the way through the funnel, from acquisition at the SEO end to conversion. So it’s SEO testing plus CRO testing together. I’m going to write a little bit more about some of the motivation for this. But, in a nutshell, it essentially boils down to the fact that it is perfectly possible, in fact we’ve seen in the wild cases of tests that win in SEO terms and lose in CRO terms or vice versa. In other words, tests that maybe you make a change and it converts better, but you lose organic search traffic. Or the other way around, it ranks better, but it converts less well. If you’re only testing one, which is common — I mean most organizations are only testing the conversion rate side of things — it’s perfectly possible to have a winning test, roll it out, and do worse. So let’s step back a little bit. A little bit of a primer. Conversion rate optimization testing works in an A/B split kind of way. You can test on a single page, if you want to, or a site section. The way it works is you split your audience. So your audience is split. Some of your audience gets one version of the page, and the rest of the audience gets a different version. Then you can compare the conversion rate among the group who got the control and the group who got the variant. That’s very straightforward. Like I say, it can happen on a single page or across an entire site. SEO testing, a little bit newer. The way this works is you can’t split the audience, because we care very much about the search engine spiders in this case. For the purposes of this consideration, there’s essentially only one Googlebot. So you couldn’t put Google in Class A or Class B here and expect to get anything meaningful. Then, crucially, search engines and users see the same experience. There’s no cloaking going on. There’s no duplication of content. You simply change some pages and not change others. Then you apply kind of advanced mathematical, statistical analysis trying to figure out do these pages get statistically more organic search traffic than we think they would have done if we hadn’t made this change. So that’s how an SEO test works. Now, as I said, the problem that we are trying to tackle here is it’s really plausible, despite Google’s best intentions to do what’s right for users, it’s perfectly plausible that you can have a test that ranks better but converts less well or vice versa. We’ve seen this with, for example, removing content from a page. Sometimes having a cleaner, simpler page can convert better. But maybe that was where the keywords were and maybe that was helping the page rank. So we’re trying to avoid those kinds of situations. That’s where full funnel testing comes in. So I want to just run through how you run a full funnel test. What you do is you first of all set it up in the same way as an SEO test, because we’re essentially starting with SEO at the top of the funnel. So it’s set up exactly the same way. So what I didn’t show in this diagram is if you were running this test across a site section, you would cookie this user and make sure that they always saw the same treatment no matter where they navigated around the site. So because Googlebot is making stateless requests, in other words just independent, one-off requests for each of these of these pages with no cookie set, Google sees the split. Users get whatever their first page impression looks like. They then get that treatment applied across the entire site section. So what we can do then is we can evaluate independently the performance in search, evaluate that on entrances. So do we get significantly more entrances to the variant pages than we would have expected if we hadn’t applied a hypothesis to them? That tells us the uplift from an SEO perspective. So maybe we say, “Okay, this is plus 11% in organic traffic.” Well, great. So in a vacuum, all else being equal, we’d love to roll out this test. We can also set an analytics tag on them and say, “Okay, wherever they navigate around, how many of them end up converting?” Then we can evaluate the conversion rate based on whether they saw treatment A or treatment B. Because we’re looking at conversion rate, the audience size doesn’t exactly have to be the same. So the statistical analysis can take care of that fact, and we can evaluate the conversion rate on a user-centric basis. So then we maybe see that it’s -5% in conversion rate. We then need to evaluate, “Is this something we should roll out?” So step 1 is: Do we just roll it out? If it’s a win in both, then the answer is yes probably. If they’re in different directions, then there are couple things we can do. Firstly, we can evaluate the relative performance in different directions, taking care that conversion rate applies generally across all channels, and so a relatively small drop in conversion rate can be a really big deal compared to even an uplift in organic traffic, because the conversion rate is applying to all channels, not just your organic traffic channel. Well, that might be a question of a redesign, moving the layout of the page around a little bit, keeping the content on there, but maybe not putting it front and center to the user as they land right at the beginning. We can test those different things, run sequential tests, try and take the best of the SEO tests and the best of the CRO tests and get it working together and crucially avoid those situations where you think you’ve got a win, because your conversion rate is up, but you actually are about to crater your organic search performance. We think this is going to just be the more data-driven we get, the more accountable SEO testing makes us, the more important it’s going to be to join these dots and make sure that we’re getting true uplifts on a net basis when we combine them. So I hope that’s been useful to some of you. Thank you for joining me on this week’s Whiteboard Friday. I’m Will Critchlow from Distilled. Check out this cool new feature Google is experimenting with in search. Thanks for visiting, and please join us next week for a new selection of the latest digital marketing news, and in the meantime you can follow us at @toprank on Twitter for even more timely daily news. Also, don’t miss the full video summary on our TopRank Marketing TV YouTube Channel. The post Digital Marketing News: Behavior & Analytics Studies, Facebook’s A/B Testing, & LinkedIn’s Carousel Ads appeared first on Online Marketing Blog – TopRank®. We recently asked the MarketingSherpa audience for tips on running effective email tests. Here are a few of the most helpful responses to consider as you start to develop an email testing program. The post SearchCap: Rich results testing tool, Google AdWords images & Search Console bug appeared first on Search Engine Land. When it comes to website or landing page design, there are dozens — if not hundreds — of potential elements to test. And that’s before you start testing how different combinations of elements affect performance. The good news is, after running thousands of tests for websites in almost every industry you can imagine, we’ve created a simple way to quickly identify the most important areas of opportunity on your site or landing page. We call this approach the “launch analysis”. Why? Well, getting someone to convert is a lot like trying to launch a rocket into outer space. To succeed in either situation, you need to generate enough momentum to overcome any resistance. To get a rocket into orbit, the propulsion and guidance systems have to overcome gravity and air friction. To get a potential customer to convert, your CTA, content and value proposition have to overcome any diversions, anxiety or responsiveness issues on your site. So, if you really want your conversion rate to “take off” (see what I did there? ), you need to take a hard look at each of these six factors. Before we dive into the launch analysis and start testing, it’s important to take a moment to review 3 important testing factors. After all, no matter how good your analysis is, if your test is fundamentally broken, you’ll never make any progress. What is my business question? If your test is designed to answer a fundamental business question, every test is a success. Even if your new design doesn’t outperform the original, your test still helps get you get some data around what really matters to your audience. Where your business question may be relatively broad, your testing hypothesis should be very specific. A good hypothesis should be an if/then statement that answers the business question (if we do X, Y will happen). We hinted at this in the last section, but every good test needs a defined, measurable success metric. For example, “if we reduce the amount of content on our page, people will like our content more” is a perfectly valid hypothesis, but it would be incredibly difficult to define or measure, which would make our test useless. When it comes to online advertising, there are tons of well-defined, actually measurable metrics you can use (link clicks, time on page, bounce rate, conversion rate, cart abandonment rate, etc.) to determine success or failure. Pick one that makes sense and use it to measure the results of your test. Now that we have the testing basics out of the way, we can dive into the launch analysis. When performing a launch analysis on a page of your site, it is critical that you try to look at your page objectively, and identify potential opportunities instead of immediately jumping into things you need to change. Testing is about discovering what your audience wants, not about making assumptions. With that being said, let’s countdown to launch! To put it simply, your value proposition is what motivates potential customers to buy. Have you ever wanted something really badly? Badly enough that you spent days, weeks, or even months figuring out how to get it for an affordable price? If you want something badly enough (or, in other words, if the value proposition is good enough), you’ll conquer any obstacle to get it. This same principle applies to your website. If you can really sell people on your value proposition, they’ll be motivated enough to overcome a lot of potential obstacles (giving their personal information, dealing with poor navigation, etc.). It wasn’t a bad page to begin with, but we believed there was opportunity to test some stronger value propositions. “Get Started on the Right Path: Prepare yourself for a better future by earning your degree from Pioneer Pacific College” doesn’t sound all that exciting, does it? In business terms, your value proposition can be described as “motivation = perceived benefits – perceived costs.” Pioneer Pacific’s value proposition made it sound like going to all the work to get a degree from their college was just the beginning of a long, hard process. Not only that, but it wasn’t really hitting on any of the potential pain points an aspiring student might have. In this particular case, the value proposition minimized the perceived benefits while maximizing the perceived costs. That’s not a great way to get someone to sign up. With that in mind, we decided to try something different. We hypothesized that focusing on the monetary benefits of earning a degree (increased income) would increase the perceived benefits and talking about paying for a degree as an investment would decrease the perceived cost. As you can see above, simply tweaking the value proposition increased form fills by 49.5%! The form didn’t change, but because our users were more motivated by the value proposition, they were more willing to give out their information. Unfortunately, many businesses struggle with this essential step. Some websites lack a clear value proposition. Others have a value proposition, but it makes potential customers think more about the costs than the benefits. Some have a good cost-benefit ratio, but the proposition is poorly communicated, and users struggle to connect with it. So, if you’re running the launch analysis on your own site or landing page, start by taking a look at your value proposition. Is it easy to find and understand? Does it address the benefits and costs that your audience actually cares about? Could you potentially focus on different aspects of your value propositions to discover what your audience really cares about? If you think there’s room for improvement, you’ve just identified a great testing opportunity! If you’ve been in marketing for a while, you’ve probably heard all about the importance of a good call to action (CTA), so it should come as no surprise that the CTA is a key part of the launch analysis. In terms of our rocket analogy, your CTA is a lot like a navigation system for your potential customers. All the rocket fuel in the world won’t get you to your destination if you don’t know where you’re going. In that regard, it’s important to remember that your CTA typically needs to be very explicit (tell them what to do and/or what to expect). After all, your potential customers are depending on your CTA to navigate them to their destination. For example, another one of our clients was trying to increase eBook downloads. Their original CTA read “Download Now”, but we hypothesized that changing the CTA to emphasize speed might improve their conversion rate. So, we rephrased the CTA to read “Instant Download” instead. As it turned out, this simple change to the CTA increased downloads by 12.6%! The download was just as instantaneous in both cases; but, simply by making it clear that users would get immediate access to this content, we were able to drive a lot more conversions. As you start to play around with CTA testing ideas, it’s important to remember the 2-second rule: If a user can’t figure out what they are supposed to do within two seconds, something needs to change. To see if your CTA follows this rule, ask a friend or a coworker who has never seen your page or site before to look at it for two seconds and then ask them what they think they are supposed to do next. If they don’t have a ready answer, you just discovered another testing opportunity. Case in point: On the page below, a client of ours was trying to drive phone calls with the CTA on the right. From a design perspective, the CTA fit the color scheme of the page nicely, but it didn’t really draw much attention. Since driving calls was a big deal for the client, we decided to revamp the CTA. We made the CTA a contrasting red color and expanded on the value proposition. The result? Our new, eye-catching CTA increased calls by a whopping 83.8%. So, if your CTA is hard to find, consider changing the size, location and/or color. If your CTA is vague, try being more explicit (or vice versa). If your CTA doesn’t have a clear value proposition, find a way to make the benefits of converting more obvious. The possibilities are endless. Like your value proposition, your content is a big motivating factor for your users. In fact, great content is how you sell people on your value proposition, so content can make or break your site. The only problem is, as marketers and business owners, we have a tendency towards egocentrism. There are so many things that we love about our business and that make it special that we often overwhelm users with content that they frankly don’t care about. Or, alternatively, we fail to include content that will help potential customers along in the conversion process because it isn’t a high priority to us. How much content do my users want? What format do they want the content in? Do mobile and desktop users want different amounts of content? As you can see above, the original page included a table of contents-style description of what readers would get when they downloaded the guide. We hypothesized that this sort of approach, with its wordy chapter titles and and formal feel, did not make the eBook seem like a user-friendly guide. There was so much content that it was hard to get a quick feel for what the eBook was actually about. Incredibly, paring the content down to a very simplified summary increased eBook downloads by 57.82%! However, when it comes to content, less is not always more. However, when the test results came in, both of these variants had a lower conversion rate than the original, word-dense content! These results fly in the face of the whole “less is more” dogma marketers love to preach, which just goes to show how important it is to test your content. So, when it comes to content, don’t be afraid to try cutting things down. But, you might also try bulking things up in some places — provided that your content is focused on what your potential customers want and need, not just your favorite talking points. Our suggestion: challenge whatever you have on your site. Try less, more, and different variations of the same. It should ultimately be up to your audience! Unfortunately, having a great value proposition, CTA and content doesn’t guarantee you a great conversion rate. To get a rocket to its destination, the launch team has to overcome a variety of obstacles. Same goes for the launch analysis. Now that we’ve talked about how to maximize motivation, it’s time to talk about ways to reduce obstacles and friction points on your site or page that may be keeping people from converting, starting with diversions. When it comes to site testing, diversions could be anything that has the potential to distract your user from reaching their destination. Contrasting buttons, images, other offers, menus, links, content, pop ups…like cloud cover on launch day, if it leads people off course, it’s a diversion. For example, take a look at the page below. There are 5 major elements on the page competing for your attention – none of which are a CTA to view the product – and that’s just above the fold! What did this client really want people to do? Watch a video? Read a review? Look at the picture? Read the Q&A? Visit their cart? As it turns out, the answer is “none of the above”. What the client really wanted was for people to come to their site, look at their products and make a purchase. But, with all the diversions on their site, people were getting lost before they even had a chance to see the client’s products. To put the focus where it belonged—on the products—we tried eliminating all of the diversions by redesigning the site experience to focus on product call to actions. That way, when people came to the page, they immediately saw Cobra’s products and a simple CTA that said “Shop Our Products”. The new page design increased revenue (not just conversions) by 69.2%! We’ve seen similar results with many of our eCommerce clients. For example, we often test to see how removing different elements and offers from a client’s homepage affects their conversion rates (this is called “existence testing”). Existence testing is one of the easiest, fastest ways to discover what is distracting from conversions and what is helping conversions. If you remove something from your page and conversion rates go down, that item is helpful to the conversion process. If you remove something and conversion rates go up – Bingo! You found a distraction. The GIF below shows you how this works. Essentially, you just remove a page element and then see which version of the page performs better. Easy enough, right? For this particular client, we tested to see how removing 8 different elements from their home page would affect their revenue. As it turned out, 6 of the 8 elements were actually decreasing their revenue! By eliminating those elements during our test, their revenue-per-visit (RPV) increased by 59%. Why? Well, once again, we discovered things that were diversions to the user experience (as it turns out, the diversions were other products!). If you’re curious to see how different page or site elements affect your conversion rate, existence testing can be a great way to go. Simply create a page variant without the element in question and see what happens! Ever have that moment when you’re driving a car and you suddenly get hit by a huge gust of wind? What happens to your heart rate? Whether you’re in the driver’s seat or an office chair, anxiety is never a good thing. Unfortunately, when it comes to your site, people are already in a state of high alert. Anything that adds to their stress level (clicking on something that isn’t clickable, feeling confused or swindled) may lead to you losing a customer. Of course, anxiety-inducing elements on a website are typically more subtle than hurricane-force winds on launch day. It might be as simple as an unintuitive user interface, an overly long form or a page element that doesn’t do what the user expects. As a quick example, one of our eCommerce clients had a mobile page that forced users to scroll all the the way back up to the top of the page to make a purchase. Yes, scrolling to the top of the page seems like a relatively small inconvenience, but eliminating this source of anxiety improved the conversion rate by 6.7%. Even more importantly, it increased the RPV by $ 1.54. Given the client’s traffic volume, this was a huge win! As you can probably imagine, the less confusion, alarm, frustration and work your site creates for users, the more likely they are to convert. When you get right down to it, conversion should be a seamless, almost brainless process. If a potential customer ever stops to think, “Wait, what?” on their journey to conversion, you’ve got a real problem. To identify potential anxiety-inducing elements on your site or page, try going through the whole conversion process on your site (better yet, have someone else do it and describe their experience to you). Watch for situations or content that force you to think. Odds are, you’ve just discovered a testing opportunity. Finally, the last element of the launch analysis is responsiveness—specifically mobile responsiveness. To be honest, mobile responsiveness is not the same thing as having a mobile responsive site, just like launching a rocket on a rainy day is not the same thing as launching a rocket on a clear day. While this page passed Google’s “mobile friendly” test, it wasn’t exactly a “user friendly” experience. The results were truly impressive. Both variants clearly outperformed the original “mobile responsive” design and the winning variant increased calls by 84% and booked appointments by 41%! So, if you haven’t taken the time yet to create a custom mobile experience, you’re probably missing out on a huge opportunity. It might take a few tests to nail down the right design for your mobile users, but most sites can expect big results from a little mobile experience testing. As you brainstorm ways to test your mobile experience, remember, your mobile users aren’t usually looking for the same things as your desktop users. Most mobile users have very specific goals in mind and they want it to be as easy as possible to achieve those goals. Well, that’s it! You’re ready for launch! Go through your site or page and take a look at how what you can do to strengthen your value proposition, CTA and content. Then, identify things that may potentially be diversions, anxiety-inducing elements or responsiveness issues that are preventing people from converting. By the time you finish your launch analysis, you should have tons of testing ideas to try. Put together a plan that focuses on your biggest opportunities or problems first and then refine from there. Happy testing! Value proposition is the maximized, optimized force of the perceived value that you are offering to potential customers. Many marketers, however, leave it on the website and forget about it in email. We’re busy testing this subject line or that, without any real strategy in mind. A peer example in this blog post will show examples of how to formulate a testing strategy for every element of email marketing, giving you an advantage over the competition and driving conversion.